Whereas in some European countries typologies for residential buildings have been used for several decades now, approaches to record non-residential buildings in a comparable structure have not been successfully implemented yet. 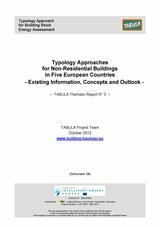 Apart from introducing or further developing typologies for residential buildings, five European partners of the TABULA project (AEA / Austria, SOFENA / Bulgaria, IWU / Germany, NOA / Greece, NAPE / Poland) have also dealt with national approaches for non-residential building typologies. Because of the broad variety of uses and associated characteristics, setting up a typology for the non-residential sector is rather complex. It is therefore important to consider both, practicability of and data availability for such a structure. In the reporting countries, available data sources and the knowledge about the non-residential building stock differ. In general, data from official statistics are fairly poor. For this reason, further knowledge is generated through national and European projects, energy audits and studies, e.g. in the framework of consulting activities. In the more recent past, databases to collect benchmarks or data from energy certificates have been set up in Austria and Poland. In Sofia/Bulgaria and Greece studies to assess the non-residential building stock have been conducted. 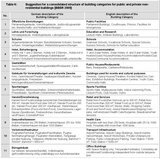 In Germany analyses concerning possible structures of a non-residential building typology, benchmarks, and end energy uses in the tertiary sector have been carried out. The proposed draft classification schemes of all five project partners refer to the different uses of non-residential buildings and their construction year classes as main parameters to differentiate building categories. For the distinction of further subtypes various suggestions are made concerning climate conditions, building size, building cubature, surface-to-volume ratio, supply systems, and the state of refurbishment. Some partners suggest to work with a limited number of building categories to begin with. In general, the analysis shows that the current state of the European non-residential building stock and on-going retrofit processes are not very well known. It is therefore important to gather more information about energetically relevant characteristics of the buildings, their quantities and the state of retrofit through further studies and surveys. Setting up compulsory databases to analyze and evaluate energy certificates for example seems to be a promising approach. Bearing in mind that the data available and even certification schemes in European countries are very different, a harmonized structure which might for instance be based on the DATAMINE project will be necessary to be able to compare and monitor the activities in the building sector on a regional, national and European level. Also for comparability and practicability reasons, it will be necessary to work with a simplified and harmonized calculation method. 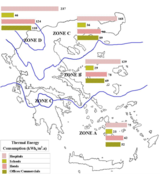 A first step in this direction has been taken with the ASIEPI project during which a method to compare the energy performance requirement levels of European countries was developed. The comparison method is accompanied by an Excel Tool which aims at the harmonization of primary energy calculations and is based on results of the EPA-NR project. In summary, it can be stated that further research on various issues is needed to be able to set up national non-residential building typologies at the same level as those for residential buildings.